Genetics – the study of genes and inheritance – is a fast-paced and exciting field of modern biology. Recent advances are revolutionising the ways in which genes and entire genomes are studied. These developments underpin human health, biotechnology and biodiversity conservation. Studying genetics, and the related field of genomics, will prepare you for careers in all these areas. Our staff have close links with organisations including Cancer Research UK and the Wellcome Trust. 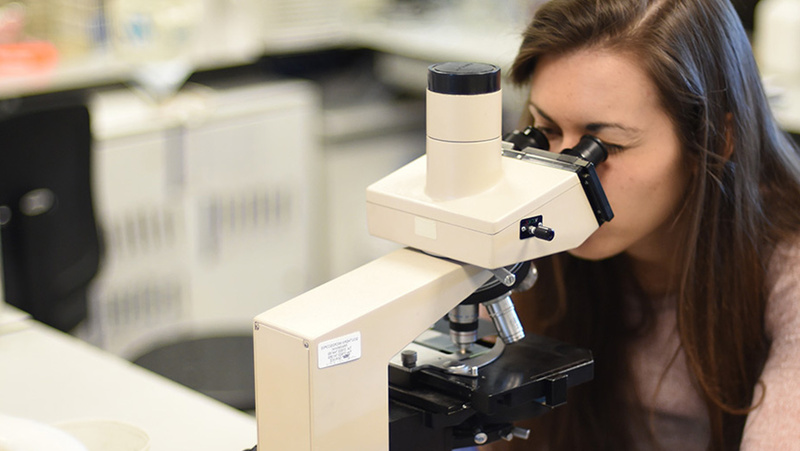 This means you’ll study topics based on the latest research findings, from biodiversity to cell regulation and cancer. You'll cover a broad range of genetics, including the molecular basis of genes and genomes, tracking down disease genes and the use of modern methods in genetics. You'll learn from experts from across this spectrum of genetics, including academics from the the Genome Damage and Stability Centre, the Sussex Neuroscience group and the Evolution, Behaviour and Environment group. A-levels must include at least one from Biology, Chemistry or Physics. You will also normally need to pass the separate science practical assessment in at least one of the science subjects. If you are not able to take the science practical assessment, applications will be considered on a case-by-case basis. Substantial amounts of Level 3 credit in science subjects. A-levels or Cambridge Pre-Us must include at least one from Biology, Chemistry or Physics. You will also normally need to pass the separate science practical assessment in at least one of the science subjects. If you are not able to take the science practical assessment, applications will be considered on a case-by-case basis. Higher Levels must include at least one from Biology, Chemistry or Physics, with a grade of 5. Grade A in A-level, and DD in Pearson BTEC Level 3 National Diploma. A-level must include at least one from Biology, Chemistry or Physics. You will also normally need to pass the separate science practical assessment in at least one of the science subjects. If you are not able to take the science practical assessment, applications will be considered on a case-by-case basis. In Applied Science and you will need to have opted for substantial numbers of modules in Biology or Chemistry related topics. Highers must include one or two science subjects (other than Maths). Ideally, you will have at least one science subject (Biology, Chemistry or Physics) at Advanced Higher. A-levels must include at least one from Biology, Chemistry or Physics. Evidence of academic studies to a high level in science subjects with good results is essential (at least a score of 8). Pass Ylioppilastutkinto with overall final result of at least EEEE, which must include at least one from Biology, Chemistry or Physics. You will need to be taking the science strand within the French Baccalaureat with good results (13/20) in at least one science subject other than Mathematics. Evidence of academic studies to a high level in science subjects with good results (12/15) in at least one science other than Mathematics is essential. Apolytirion with an overall average of at least 19 will be considered for first-year entry. You must also have either Apolytirion pathway in at least one from Biology, Chemistry or Physics with a score of 19 or the Pan Hellenic in at least one from Biology, Chemistry or Physics with an overall score of 17. Highers will need to include at least one from Biology, Chemistry or Physics, with a grade H1. Pass Matura with least 3 Extended level subjects in the 80th percentile including at least one from Biology, Chemistry or Physics. Diploma de Bacalaureat with an overall average of between 8.7 including a score of 8 in either Biology, Chemistry or Physics. Fullstandigt Slutbetyg/Högskoleförberedande Examen with a total of 2,500 credits to include B grades in the majority of subjects and to include grade B in in either Biology, Chemistry or Physics. Advanced Placement Tests with scores of 5,5,4 in three subjects. genomics and bioinformatics options give you experience in the analysis of large data sets – marketable skills relevant to a wide range of scientific and non-scientific careers.